Mitch Glazer’s Passion Play has finished filming so now we get our first glimpse of the stars Mickey Rourke and Megan Fox via EW. This is the film set in 1950’s LA and revolves around a washed-up trumpet player (Rourke) who saves a carnival-attraction angel (Fox) from Murray’s menacing mobster. However, in the photo above I can’t see any wings? 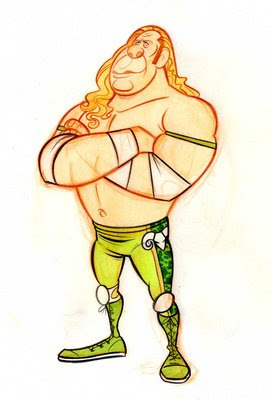 His character in Passion Play seems similar to Randy the Ram from The Wrestler in that they are both seeking redemption. Rourke commented on this and also said some surprising things about his co-stars from that and their lack of chemistry, “Well, The Wrestler was quite tough. There wasn’t much chemistry there. Uh, that’s a whole other conversation. With Megan and I, there’s a lot of chemistry and a lot of respect. We’re both comfortable with each other. As far as the redemption is concerned, it’s almost fate.” Good old Rourke, always willing to stir the pot a bit. Writer/director Glazer wrote the scripts for Scrooged, The Recruit, and the 1998 adaptation of Great Expectations. All in all it does sound like it should be an interesting film to watch. I hope Rourke brings his Angel Heart mojo to this one and Murray is always great to watch. As for Fox? Well maybe Rourke is right and she just hasn’t had the chance to shine in a proper role until now. His comments about the lack of chemistry with his Wrestler co-stars seems a bit odd. What do you think about Rourke’s comments about The Wrestler and Megan Fox? Do you think she has hidden acting talents or is she just a pin up who got lucky? It has been a while since there has been an update regarding this project. An MGM spoke to io9 about the Robocop remake / reboot. It is still being made, but it won’t be out for a 2010 release. 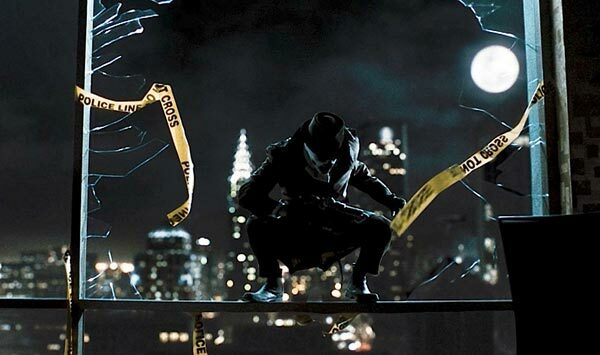 The rep said that the studio had told distributors at an event a couple weeks ago to expect the movie in 2011. He said director Darren Aronofsky (The Wrestler, The Fountain) and screenwriter David Self (Road to Perdition) were still working on the script, and that no casting had been completed. I do still wonder what they can do with Robocop. The original film was a work of wonder. The fact Aronofsky is attached does intrigue me though. 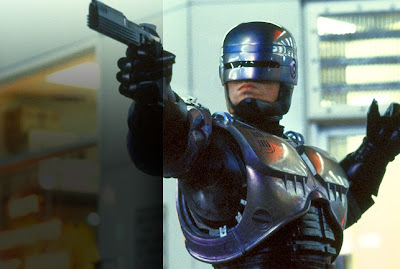 Hopefully, they’ll keep the cool look of Robocop in place. What do you want from the new Robocop film? Who could play the titanium encased lawman? A while back Mickey Rourke and Chris Jericho had a bit of a slanging match on Larry King’s show. Now at the recent WrestleMania show Rourke got into the ring and laid a few punches on Jericho. All a big act of course, but pretty cool nontheless. The Slasher by Darren Aronofsky "If you’ve ever been folded backwards you’ve seen me!" Johnny at the always excellent Freddy in Space site (check it out if you love horror – loads of stuff on there) has come across this brilliant Jason (Friday the 13th) and The Wrestler mash-up. Make sure you listen to the Bruce Springsteen inspired song. The Oscars have been announced and looks like Slumdog Millionaire sweeped the board. Heath Ledger won best supporting and Sean Penn won best actor. What did you think of the results? Any surprises or totally predictable? Was Stephen Colbert correct in his predictions? There is an Oscars thread set up in the forum if you wish to have a chat about it. 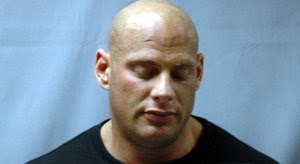 An actor who played a steroids dealer in the movie The Wrestler was arrested on drug charges after leading police on a high-speed chase in Eastchester on Thursday. Scott Siegel was under surveillance by DEA agents who saw him picking up a package in New Rochelle on Wednesday before leading them on a car chase in his SUV, investigators said. Siegel struggled with DEA agents before they were able to take him into custody at the intersection of Highland Avenue and Main Street, authorities said. Siegel is charged with attempting to distribute steroids and assaulting a federal agent. Thursday’s arrest was not Siegel’s first brush with the law. He was arrested in 1999 for distributing steroids, ecstasy and an animal tranquilizer that can be used for hallucinations. Siegel’s character sells the main character Randy “The Ram”, played by Mickey Rourke, steroids and painkillers in a locker room in “The Wrestler”. This great piece of art work is by Ben Balistreri who has worked on Fosters Home for Imaginary Friends, Danny Phantom and many other things. He was just messing around with his drawing of Mickey Rourke’s Randy “The Ram” but it does look cool.